Peabody Ice Climbing is an ice & mixed climbing venue located in Fenton, Michigan on a retired apple orchard. Our venue has become a place for seasoned ice climbers to train for the mountains, and also provides an ideal introduction for beginners in a controlled environment by experienced and certified instructors. Two towers, 45ft and 72ft tall, are iced over in the winter to offer a place for experienced ice climbers to train and to provide a great introduction for people interested in the sport. We have the only permanent mixed climbing/dry tooling training facility in the United States. Our mixed climbing routes are ideal for both winter and off-season training, for climbing competitions, and for learning new ways to use your axes and crampons. In addition to the two ice towers and the mixed walls, our venue has a heated club house where you can rent climbing gear, a 10-person sauna, and a heated bunk house that will accommodate up to 12 people. We also welcome you to pitch a tent and camp on-site. Want to bring your company retreat, outdoor club, or just a big crew out for a day on the ice? Cool, just contact us to reserve your space in advance so we can accommodate your group. Want to come for the weekend, test your gear, and crash in the heated bunk house? Great, overnighters welcome, just let us know! 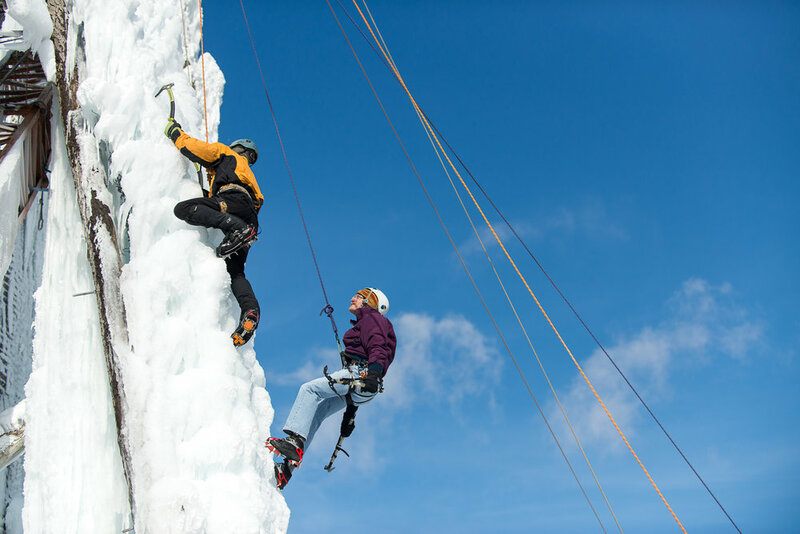 We have an American Mountain Guide Association certified instructor, and welcome beginners to come try ice and mixed climbing in a fun and safe environment. Some belay experience is recommended but not required.